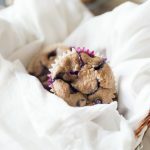 Healthy no sugar added blueberry muffins are the perfect treat. These muffins are sweetened naturally with dates and can be quickly thrown together using just your blender! Start a small pot of 1/2 cup water and wait for it to boil. Place chopped dates into a blender. Then pour boiling water on top of the dates. Blend until dates are pureed. Add remaining ingredients (except blueberries) to blender, starting with the dry ingredients. Once all ingredients are in the blender, blend until mixture comes together. Pour directly into a greased or lined muffin pan, about 3/4 full. Bake for 18-22 minutes, until the center of the muffins bounce back when gently poked. You can also make these without flour. Just substitute oats for the flour. If you’d like these to be sweeter, you can also add a tablespoon of honey to the mix. Recipe adapted from Bren Did Blog.